Here is an excerpt from an article published on curatormagazine.com about my burger series of photographs. It is within the context established through Schlosser, the nostalgic tones of the 1950′s visual aesthetic in theBurger Series (Figure 4) by Jeff Vespa, can be understood. Vespa visited the fast food joints around Los Angeles in order to recreate the out-dated stock images found on laminated menus in the diners across America. Hamburgers were only purchased from restaurants where the consumer was required to order at the counter, brought back to Vespa’s studio and styled to present all of the ingredients in the sandwich to the viewer. 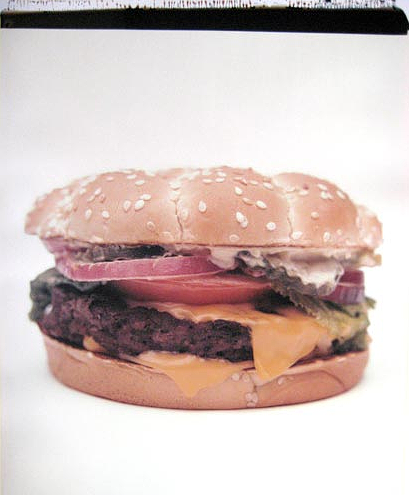 The images were shot with a Polaroid camera, one photograph of each burger, each an original artwork. The idea of originality is in direct contrast to the subject of Vespa’s work. The fast food restaurants from which the hamburgers were sourced standardized every aspect of production — from the diameter of the patty, to the exact amount of ketchup and mustard. This enabled the company to manufacture and assemble — not typical verbs associated with food production– the same product in every restaurant. By using the Polaroid camera, Vespa references the Pop art movement because “the image is instantly recognizable and when you see so many in repetition it reminds you of Warhol.” For the viewer, the vintage medium presents the appetizing hamburger so that it is easy to visually consume and recalls faded childhood photographs, highlighting our latent juvenile desires.